Offering you a complete choice of products which include embroidery chiffon saree, embroidered white saree, embroidery printed saree and embroidery sarees. With the inclusion of advanced techniques, we are involved in offering a wide gamut of Embroidery Chiffon Saree. Enhance the look of the wearer, these sarees offered by us are crafted using finest quality fabric and latest machinery. Being a quality centric organization, we assured our clients that we are delivering defect free sarees to our esteemed clients. These sarees are available in varied attractive designs, alluring colours and shades within promised time frame. Being the most respected organization guided by experienced and knowledgeable professionals, we provide an enormous assortment of Embroidered White Saree. 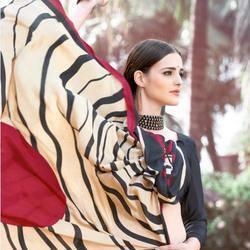 These sarees are known for their finest quality and cost effectiveness in the market. The sarees offered by us are intricately designed under strict guidelines using finest quality fabric and latest weaving technology. Our qualitative range is praised for its perfect finish, alluring patterns and other such features all over the world. Symbolic to all the success we have gained, we are offering a wide range of Embroidery Printed Saree to our clients spanning all over the nation. 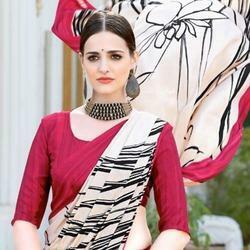 These sarees are designed using advanced techniques and premium quality fabric. 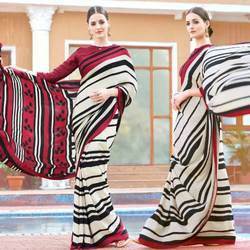 The offered sarees are examined meticulously on different quality parameters in order to maintain universally accepted standards. Available in varied colours, prints, patterns and designs, these sarees can be purchased at industry leading rates. With our in-depth knowledge and domain expertise, we are offering an excellent range of Embroidery Sarees. Our offered sarees are tailored by our professionals in accordance with the latest fashion trends prevailing in the market. The entire range is designed using high-grade fabric and sophisticated technology. In addition to this, our sarees are quality checked under the supervision of our quality controllers to ensure a defect free range at clients' end.